Chris Kreider and Rick Nash both scored in tonight’s comeback win over the Devils, and continue to be a part of the Rangers’ top line. Photo courtesy of Getty Images. After allowing 3 straight goals to the Devils, all on the power play, the Rangers managed to find a way to come back and score three straight goals of their own, winning on a Kevin Klein goal in overtime. Rick Nash scored the tying goal late in the third, continuing his dominance to the start of the season. He now has 8 goals on the year, which is the most in the NHL, with a total of 9 points for the year. Lundqvist was pretty sharp again tonight, and did not allow an even strength goal. 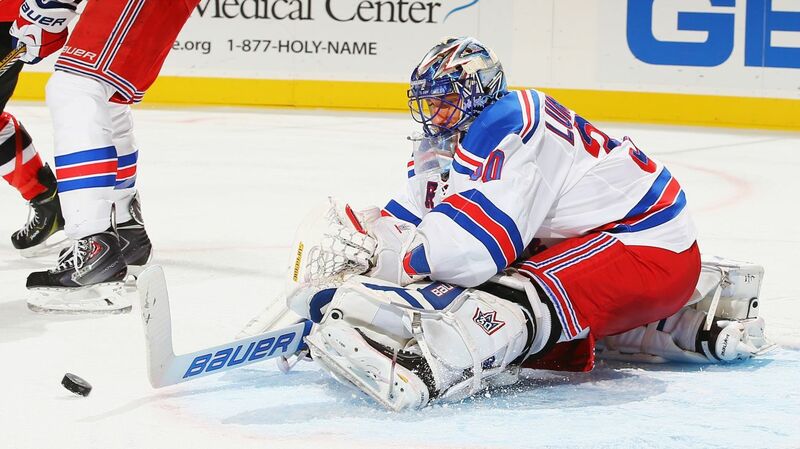 Lundqvist made 28 saves as well as some crucial stops late in the third period and in overtime. Special teams was the story of the game tonight, with 5 of the goals scored coming with a team on the man advantage. The first period was fast and physical. Both teams had chances early, and both Lundqvist and Schneider made the stops early. The Devils got the first power play on a hooking call on Kevin Hayes, and came close twice. As most Rangers vs. Devils games usually are, tonight’s game was very physical, with a lot of hits, like this one from Tanner Glass. Photo courtesy of Getty Images. One of the shots rang off of the post, and the other was stopped thanks to a sprawling save by Henrik Lundqvist, where he stopped Patrick Elias’ wrister by reaching up his non glove hand to stop the puck. The Rangers killed off that penalty, and drew one of their own almost immediately after, with a tripping call on Jaromir Jagr. The Rangers would strike first and score their first power play goal of the season, after starting the year 0-17 on the power play. Martin St. Louis got the puck along the boards and worked it out to McDonagh at the point. McDonagh fired a low shot off of Schneider’s tight pad and Chris Kreider was there to clean up the rebound for his second goal of the season. St. Louis picked up his 5th assist of the year, and has done a great job setting up plays for New York. McDonagh picked up his first point of the season with the assist. 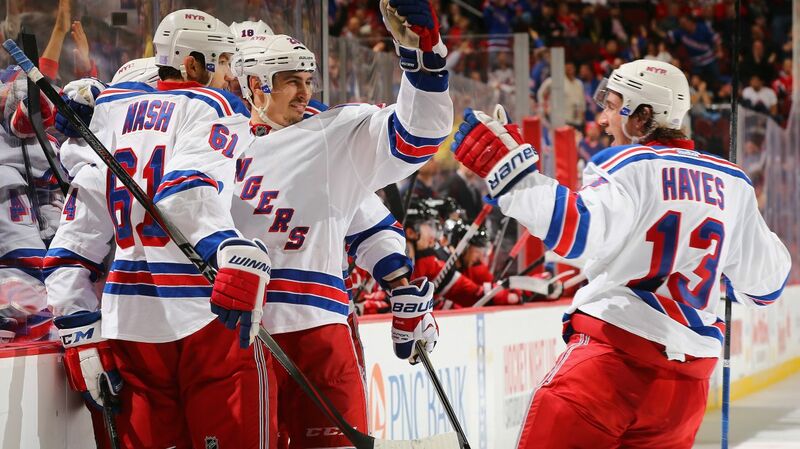 Chris Kreider celebrates after scoring the first goal of the game, and the Rangers’ first power play goal of the season. Photo courtesy of Getty Images. About 13 minutes in, Kreider took a hooking penalty. The Devils would convert on this power play, after Jaromir Jagr scored on a rebound that Damien Brunner intentionally shot wide off of the boards. It was Jagr’s first goal of the season and it tied the game at 1. The goal was Jagr’s 706th of his career in the NHL. There was a few other chances for the Rangers, most notable the two chances Zuccarrello had in front. St. Louis would feed Zuccarello alone in front on two different occasions, but he could not finish. The Brassard line looked great today, creating a lot of chances. In the second period, the Rangers got a great chance early. After a Kevin Hayes takeaway, he got the puck to Kreider, who hit the crossbar on a sharp angle shot. The Rangers played solid defense this period, with Ryan McDonagh and Matt Hunwick standing out. 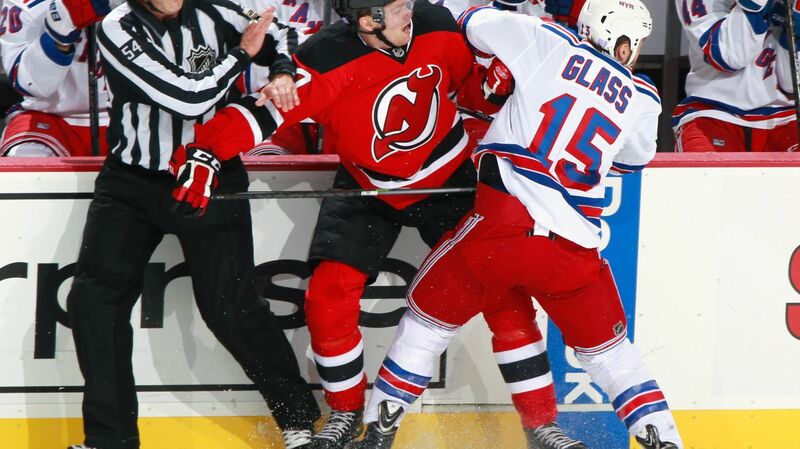 Both of them worked hard in their own zone, blocking shots and playing the Devils tight to limit their chances. Overall, the Rangers defense was pretty good, it was just the power play that struggled. Ryan McDonagh had a really good game, picking up his first two points of the year and doing a good job defending in his own zone. Ryan Malone would take an interference penalty with about 5 minutes to go. The Devils would take advantage of this chance, and Adam Henrique scored his third goal of the year on a one timer that hit off of Kevin Klein’s leg and bounced past Lundqvist. Jagr picked up the assist on the goal. Chris Kreider would take another penalty at the end of the second, this one being an interference call. The Devils did not score, but the penalty carried over and the Devils went into the final period with a 2-1 lead. With the continued power play, the Devils connected again less than a minute into the third period. Jon Merrill got the puck and slapped it past Lundqvist, giving the Devils a 3-1 lead on their third power play goal of the night. At this point, it did not look good for the Rangers. The Devils had scored 3 straight power play goals and the momentum had swung towards the Devils. But they showed a lot of adversity in this game, and continued to battle for the rest of the period. Rick Nash got the puck, and drove hard to the net but was bumped into Schneider, which got him a goalie interference penalty. The Rangers did a good job this time and managed to kill off that chance. The Rangers continued to pressure, with the Brassard line creating more chances and almost connecting again. The pressure forced Mike Cammalleri to lift the puck out of his own zone, but it went over the glass for a delay of game, giving the Rangers their own power play chance. Chris Mueller scored the Rangers’ second power play goal of the night, and helped them climb back from a 2 goal deficit. New York would connect on the power play for the second time this game with 11 minutes to go. Derick Brassard made an exceptional pass that seemed to go through the entire Devils’ team and found Chris Mueller, who one timed it past Schneider on the left wing position. It was Mueller’s first goal of the season, as well as Brassard’s first assist of the season. McDonagh also picked up his second assist of the game. With the game now within reach, New York was even more motivated to win. They continued to lay on the pressure, really giving the Devils a tough time in their own zone. But at 14:32, the Rangers tied the game on a goal by, who else, Rick Nash, who has been the Rangers’ best player this year and one of the best players in the league. 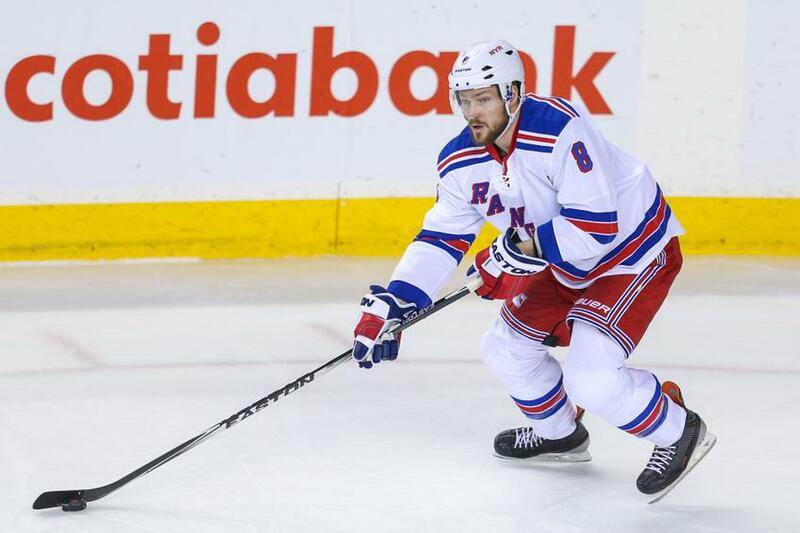 Rick Nash forced a turnover along the boards, and the puck came to Kevin Hayes in front. Hayes fired a shot at Schneider, and Nash collected the rebound, using a slick deke to get it past Schneider’s stick and backhanded it into the net to tie the game. It was Nash’s 8th goal in seven games, and Kevin Hayes picked up an assist on the goal, his first of the season and of his career. He also has points in two straight games. 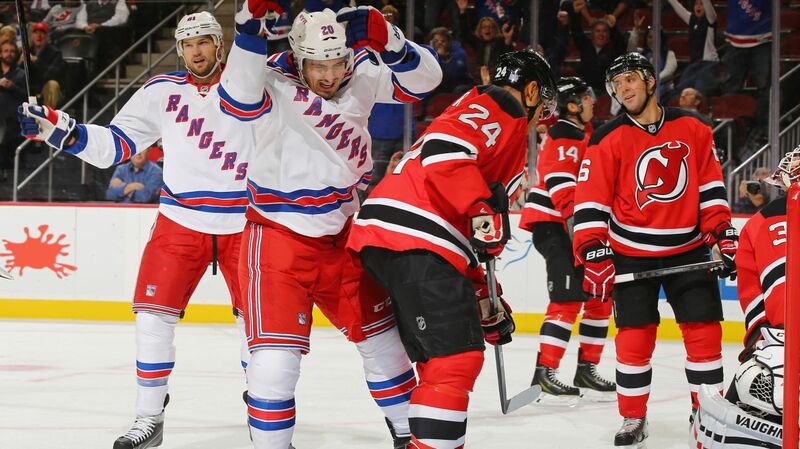 Rick Nash scored again tonight, giving him 8 goals this season, the most in the NHL. Kevin Hayes picked up an assist and the line played very well once again. Photo courtesy of Getty Images. The rest of the game was really intense and physical, with both teams almost scoring numerous times. Kevin Hayes almost tipped one in, Stempniak hit the post, and Lundqvist made some great saves to stop the Devils. The horn sounded, and the game was headed to overtime. 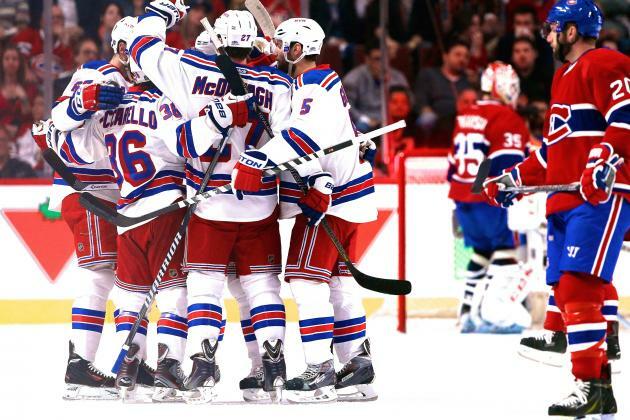 The Physical play of the Rangers and the increased offensive pressure turned the game around for the Rangers. They started playing with emotion, and were able to channel that to tie the game up late in the third. In overtime, the Devils had pressure early, but were not able to score. 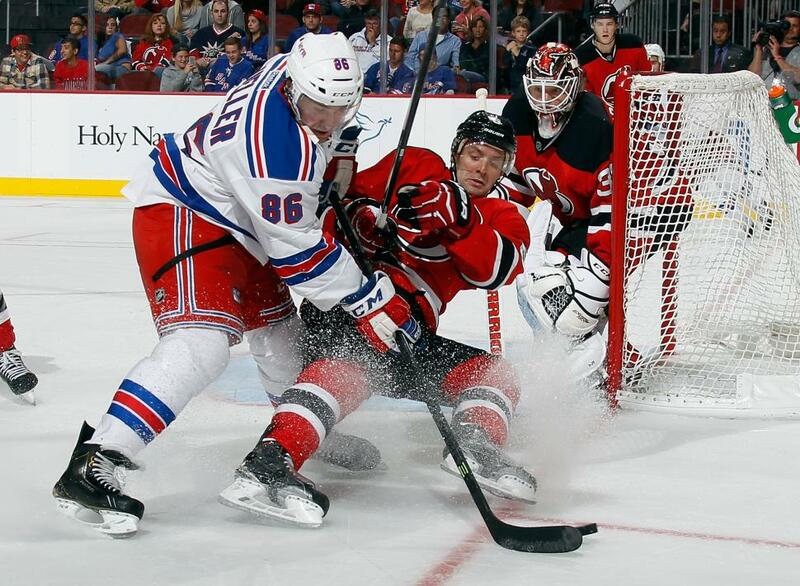 Following a Devils’ shot that went wide, the Rangers collected the puck behind the boards and broke out. Chris Mueller carried the puck through the neutral zone and got it to Kreider. Kreider did a great job to keep the puck away from the Devils’ defensemen, and made a nifty pass to the trailing Kevin Klein. Klein, who is not known for his offensive skills, fired a wrist shot into the back of the net, capping off a fantastic comeback win for the Rangers. The goal was Klein’s first of the season, and Kreider and Mueller both picked up assists. 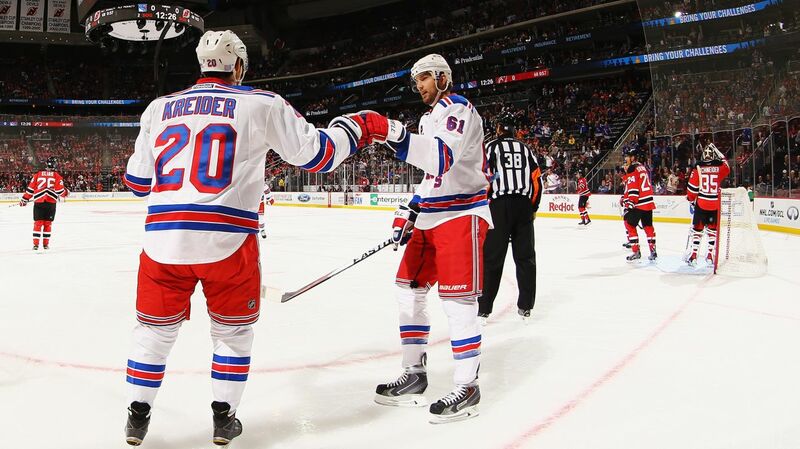 Kevin Klein scored the game winner in overtime off of a great feed from Chris KReider. It was Klein’s first goal of the season. This game was definitely the most exciting game of the year, and definitely one of their best games of the year. Although the penalty kill was pretty bad at times, they managed to kill off a late penalty and overcame the adversity to win it late, scoring 3 straight goals in a span of 14 minutes. Henrik Lundqvist had a quality start for the third straight game. None of the goals for the Devils came at equal strength, and one of the goals was deflected off of the Rangers’ Kevin Klein. He made some big saves, and was strong when they needed him most. He finished with 28 saves. Henrik Lundqvist was very sharp again tonight, stopping 28 shots and not giving up a goal while the teams were at even strength. Lundqvist has now won his last three starts. Photo courtesy of Getty Images. Chris Kreider had a great game. He scored the first goal of the game, and the first power play goal of the year for the team, as well as setting up Kevin Klein in overtime on a great pass behind him. He now has 2 goals and 4 assists this season. Kevin Hayes did a good job centering the top line again. He had a few good chances, and was good on the fore check. Hayes also had the assist on Rick Nash’s goal. He struggled in the faceoff circle, but once he figures that out, his game will be even more complete. Rick Nash is dominating. Leading the league in goals, Nash scored when his team needed it most, and tied the game at 3 in the final minutes of the third. Nash is playing with confidence and he is scoring really good goals. What’s nice to see is that he doesn’t need to be fancy to score these goals, he is just firing them past goalies or making smart reads set up by his linemates. It’s great to see Rick Nash blossoming into the goal scorer we all knew he could be. The Brassard line really surprised me tonight. Although they did not score, Brassard and St. Louis both picked up assists. St. Louis and Zuccarello both seemed to have a connection, with St. Louis nearly setting up Zuccarello on multiple occasions. The quick, highly skilled line played very well tonight. 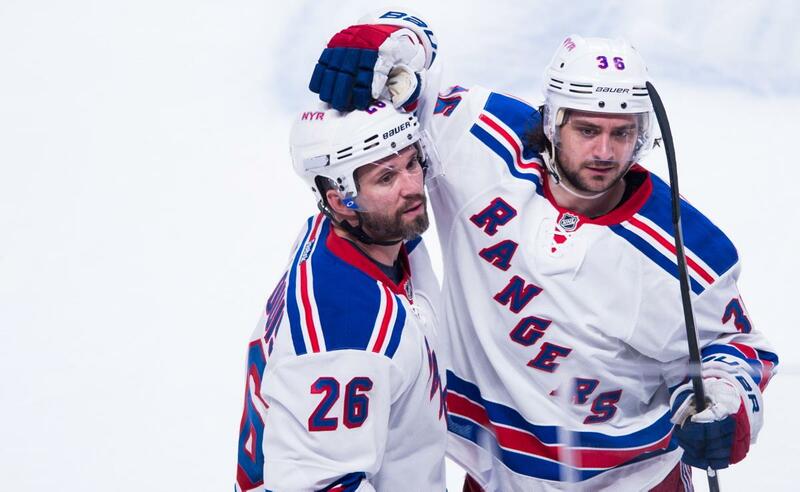 Martin St. Louis and Mats Zuccarello played really well together, and the line with Brassard and them showed chemistry. Ryan McDonagh had a very good game on both sides of the puck. He picked up two assists, both on the power play goals, and was solid in his own zone. Kevin Klein has been working hard, shouldering a lot of the workload with Dan Boyle’s injury, and it is good to see him rewarded with the overtime winner tonight. The power play was much improved, moving the puck a lot more effectively and connecting on two goals. The Rangers need to continue to use their power play units as an offensive weapon, rather than it being their own kryptonite. The penalty kill on the other hand, was not that strong. They yielded three goals, and struggled to clear the puck and shut off passing lanes. They did kill a penalty in the third, which was timely, but it will need to get better in the coming games. The Rangers will not play again until Saturday, where they will travel to Montreal in a rematch of the Eastern Conference Finals last season. Montreal is off to a great start, with a 6-1 record and many of their players clicking offensively. This game should be very exciting. The Rangers next game will be on the road against the red hot Montreal Canadiens, a rematch of the 2014 Eastern Conference Finals. The Rangers extend their modest win streak to three games, and will look to extend it to 4 against the Canadiens on Saturday night. 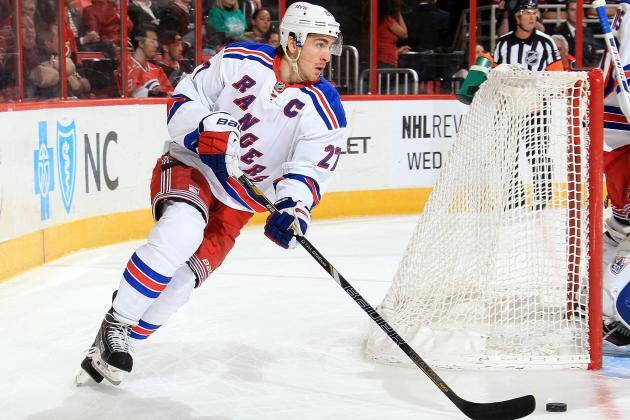 Posted on October 22, 2014, in Game Recaps and tagged Anthony Duclair, Carl Hagelin, Chris Kreider, Chris Mueller, Dan Girardi, Derick Brassard, Henrik Lundqvist, Kevin Hayes, Kevin Klein, King Henrik, Madison Square Garden, Marc Staal, Martin St. Louis, Mats Zuccarello, Matt Hunwick, Michael Kostka, MSG, New Jersey Devils, New York Rangers, NHL, NHL 2014-2015 Season, NY Rangers, NYR, overtime winner, Rangers Nation, Rangers Season Opener, Rangerstown, Rick Nash, Ryan Malone, Ryan McDonagh, The Duke, The Ranger Zone. Bookmark the permalink. Leave a comment.